Patience may be a virtue in a person, but in an infectious disease, it is insidious. Witness tuberculosis, which can lie dormant in a human host for decades before bursting forth into infection. TB’s stealthy nature has made it difficult to decipher how it spreads, seriously hampering efforts to control it. The World Health Organization estimates that a third of the people on Earth are infected. Now, a study led by Stanford scientists has provided new insights into the behavior of tuberculosis by tracing the travels of a particular strain of the disease that was spread unintentionally among the indigenous peoples of western Canada by French Canadian voyageurs during the fur trade era. Although the disease was probably brought into the native populations repeatedly from about 1710 to 1870, it didn’t spark an epidemic until the fur trade had largely ended, more than 150 years from when it was first introduced. “We found there was this widespread, low-level dispersal of tuberculosis that did not become obvious until environmental changes occurred that created conditions conducive to epidemics,” said Caitlin Pepperell, an infectious diseases specialist at Stanford. The process, she said, resembles the way a smoldering fire can spread underground, through the roots of trees and brush, then burst into fire without warning. “Tuberculosis epidemics are the outcomes of a process that has effectively been occurring underground,” she said – unlike smallpox, which quickly escalates into epidemics. The conditions that finally triggered epidemics in Canada in the late 1800s likely resulted from the relocation of native peoples onto reservations, where health conditions were often abysmal. The biggest factor, she said, was probably malnutrition. The buffalo, once a dietary mainstay of indigenous peoples on the prairie, had been virtually exterminated by then. Other principal food sources, such as other animals, wild plants and fish, were also severely depleted and attempts to provide famine relief fell woefully short. Housing was also of low quality, with too many people living in close quarters, often lacking adequate ventilation or protection against the elements. Pepperell, a physician and an instructor in the division of infectious diseases at Stanford’s School of Medicine, is the lead author of a paper about the study published online by Proceedings of the National Academy of Sciences this week. “Up to now, it has been relatively hard to define the locations of origin of a strain of tuberculosis more precisely than a continent,” said Marcus Feldman, professor of biology and a co-author of the paper. By looking at large numbers of bacterial samples and integrating genetic analysis with the work of fur trade historians, the researchers gained insight into how this particular strain must have spread. They worked with archived M. tuberculosis bacterial samples from indigenous communities across Alberta, Saskatchewan and Ontario that had been previously collected by provincial health authorities. All the analyses were done on bacteria, not people. The scientists found a single strain of tuberculosis, characterized by a specific mutation, dominated in every community. Earlier research had established that the same strain was also dominant among French Canadian residents of Quebec. “The tuberculosis strains from Quebec are missing a specific piece of DNA; that’s how you can track them back to Quebec,” Feldman said. Tuberculosis can only be transmitted by someone with an active infection who is in close contact with others. 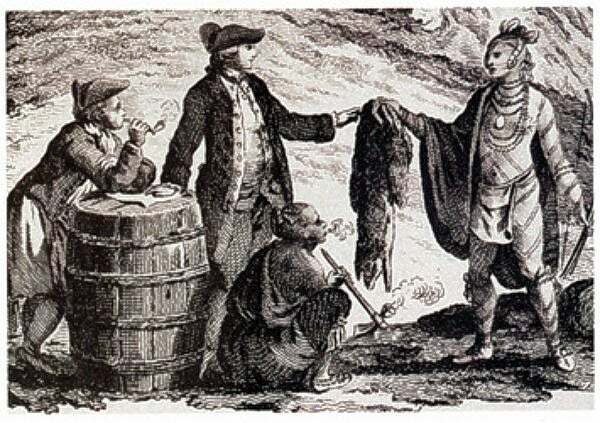 The only time when French Canadians and the native peoples of Canada had substantial contact of that kind was during the fur trade era, so that had to be when the strain spread from the traders to the natives, Feldman and Pepperell said. It was common during that era for traders to live in close contact with the native peoples, sometimes for months or years at a time. Enough of them formed close relationships that their unions gave rise to the people known as the Métis, who are of mixed indigenous and French Canadian ancestry. “There were handfuls of cases of TB stretched out over this long time period, where clearly TB was being transmitted, but the number of cases was such that it was not obvious to anyone at the time,” Pepperell said. “TB, from what we can tell, was just kind of rumbling along at this very low level and probably would have continued that way, or even petered out completely, if it wasn’t for the deplorable living conditions on the reserves,” she said. But by 1870 the era of the fur trade in its traditional, canoe-based form was over. There was no longer any need for the voyageurs, as furs were now transported by train. Most of the indigenous tribes had been relocated to reservations, and forays by French Canadians largely ceased. At the same time, the influx of settlers to western Canada skyrocketed. The population of western Canada grew from 110,000 in 1871 to 750,000 in 1911. Based on another researcher’s analysis of original documents from the Hudson’s Bay Company and other primary sources, Pepperell and Feldman estimate that only about 5,500 voyageurs had penetrated what was then the western wilderness during the entire 160-year span of the fur trade. In spite of the huge numbers of immigrants after 1870 from regions in Europe, America and East Asia with high incidences of TB, these more recently arrived strains made scant inroads into the native population. That lack of transmission was likely due to a lack of social interaction between the settlers and the natives, and preserved the dominance of the French Canadian strain. Pepperell and Feldman said it is too early to tell how applicable the results of their study will be in other settings, as not enough is known about the factors affecting tuberculosis migration in general. “This approach of looking at the genetics in concert with epidemiology is fairly new in the world of bacterial research,” Pepperell said. “I would say in terms of the overall research on TB, it is a little bit like the organism itself.